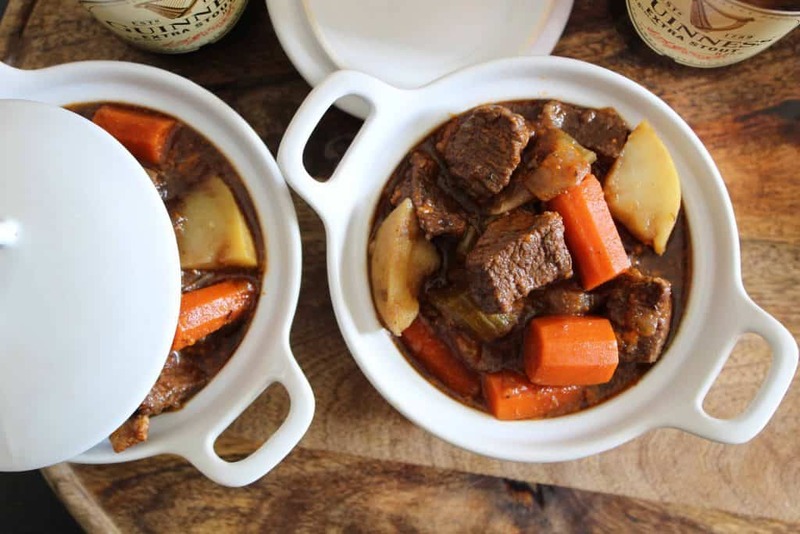 Irish-American Guinness Stew is tender bites of beef nestled in a savory Guinness Stout broth with onions, potatoes and carrots. Irish-American Guinness Stew is not only hearty, filling and delicious, but it can be made on the stove in one big stock pot, or in the slow cooker. Back in the day, traditional Irish stew, or “Stobhach,” was made with mutton, onions, potatoes and water. 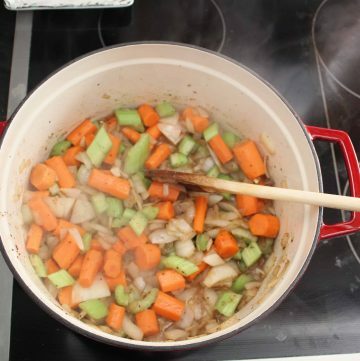 The dish was considered peasant food because the Irish had to live off the land–farmers grew root vegetables (parsnips, carrots, onions and potatoes) and raised sheep for milk and cheese, warmth (from the sheering and sheepskin) and ultimately for food. Beef was not an ingredient in this working man’s dish because it was expensive and consumed exclusively by the upper classes. 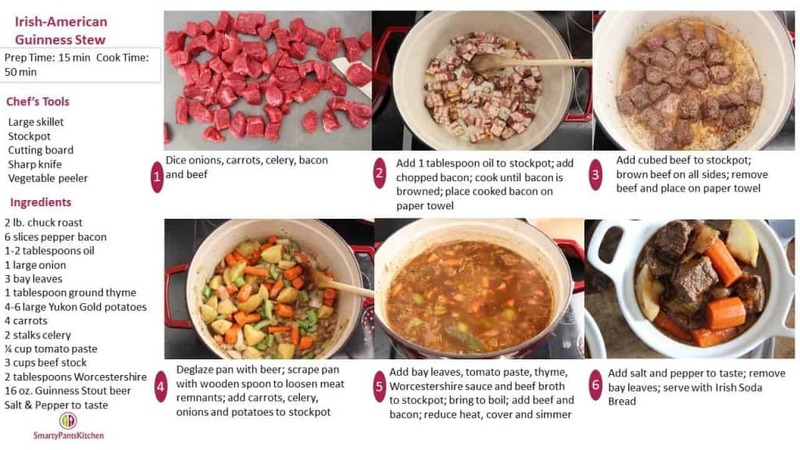 The earliest recipes for Irish Stew indicate all of the ingredients were placed in a large pot, or cauldron, with water and cooked over an open fire for many hours. 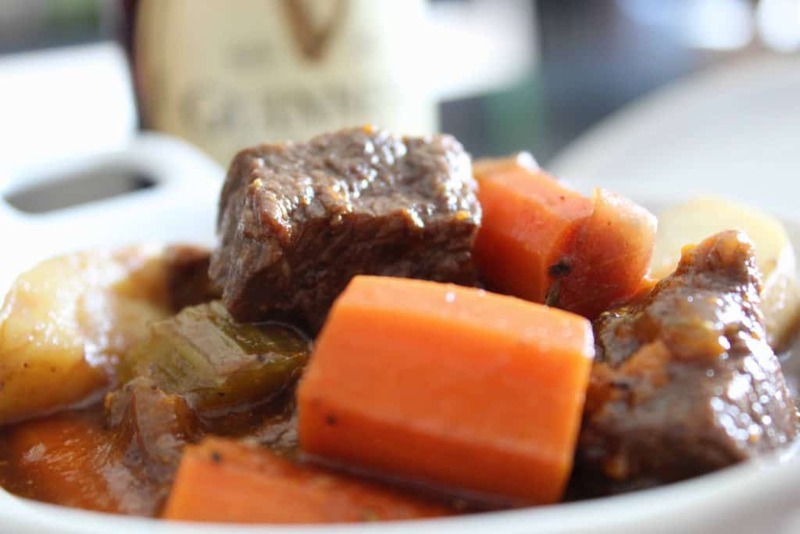 This Irish-American Guinness Stew recipe features beef, instead of mutton, onions, potatoes, celery and carrots…the inclusion of carrots in a so-called Irish stew is quite controversial, but they are included in this recipe to provide additional nutrients and color. 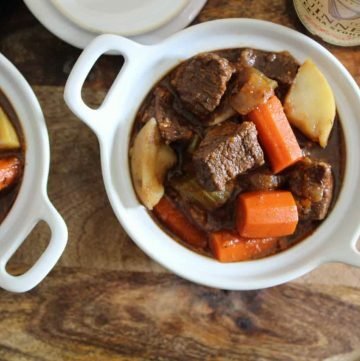 Can I Make Irish-American Guinness Stew in a Slow-Cooker or Crock Pot? 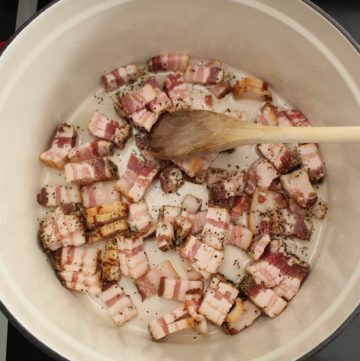 Yes, If you want to make this recipe in a slow-cooker, simply cook the bacon and sear the beef first, then put everything else into the crock pot. You may need to add a little more water or beef stock. Cook on low 5-6 hours. What Cut of Meat Do I Use? 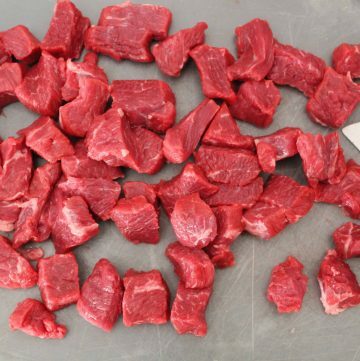 It is not necessary to use more expensive, tender cuts such as sirloin. 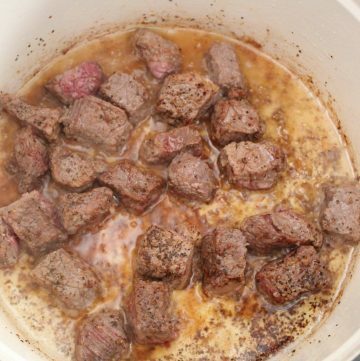 This recipe uses cubed chuck roast; however, you could use round or top steak. Because the beef is seared first, then cooked low and slow, the chuck roast becomes very tender during the cooking process. 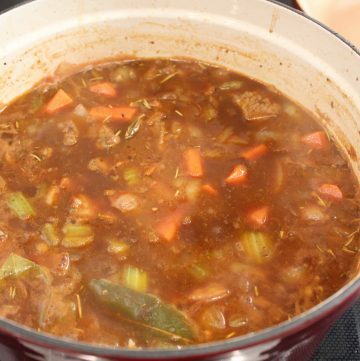 Can I Make Irish Stew Without Alcohol? 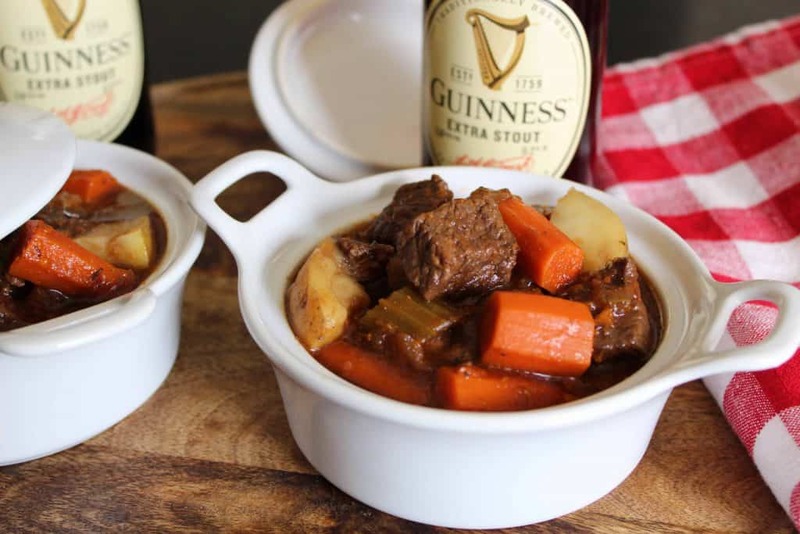 The Guinness Stout lager, made with barley, roasted malt extract and hops is what truly makes the seasoning so spectacular ; however, if you cannot use Guinness, you might try a very strong beef stock or add a bit of espresso to the stew. 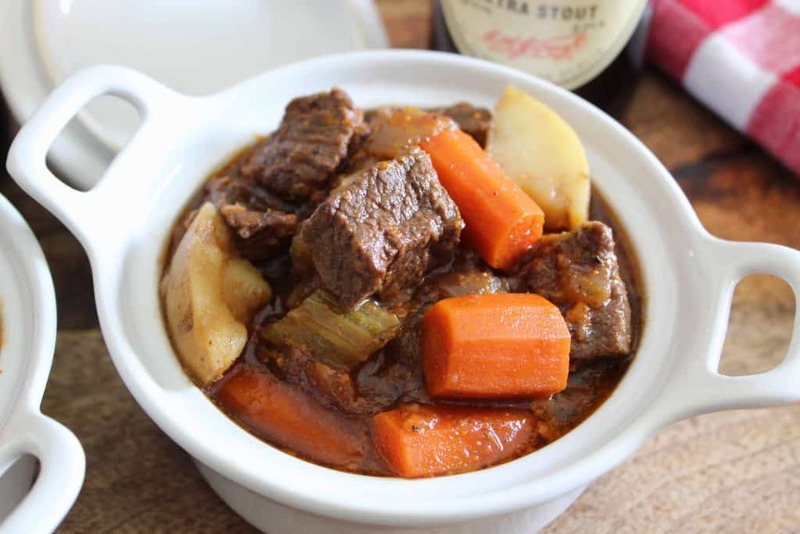 Keep in mind that even bringing the stew to a boil will not cook off all of the alcohol; about 2% remains, so if you’re cooking for someone who is intolerant of alcohol, use a cup of espresso, strong beef stock or mushroom broth. Irish-American Guinness Stew with beef nestled in a savory Guinness Stout broth with onions, potatoes and carrots. 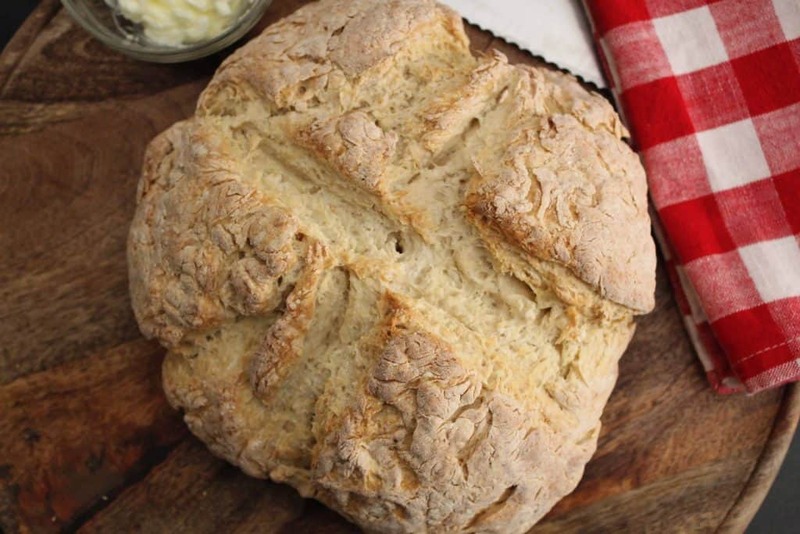 Make a loaf of Irish Soda Bread while your Irish-American Guinness Stew is simmering!